With the HSM LED it’s possible to install an optical monitoring of the ionization system at a well observable point. The high voltage monitor HSM LED can be inserted at any point in the high-voltage wiring between the power brick and the ionizing unit. The appropriate, "click-zag" supports a wall mounting. The green indicator light flashes when the properly high voltage is supplied. For undervoltage or the lack of high-voltage, the indicator light goes out. 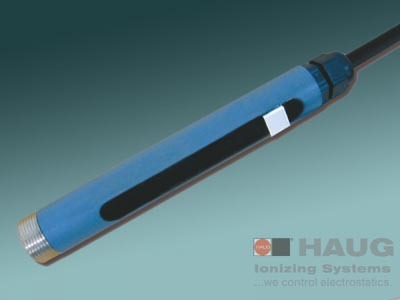 Type: HSM LED inkl. HV-cabel. Length: HSM LED inkl. HS-Kabel. The length of the HSM LED is taken into account when calculating the maximum connection length!